The email from the organisers has the link to the club stand map if Petes doesn't come out clear. All that’s left to do is wash the car.. The email I received only had PDF's for my ticket,stand pass and vouchers..nothing about a stand map..
My bad then because whilst printing everything possible for Trax I had printed one, but having looked at it it is a download from the club forum which only shows the stand location and has not printed the stand names table. ooops! The smell of bacon cooking will soon clear your head. ChrisHolmes wrote: The smell of bacon cooking will soon clear your head. So,doing a last bit of prep for tomorrow,and discover my NFC windscreen phone mount has decided to fall to bits..
Gonna see if I can bodge it together,but otherwise it'll be a reversion to the 'back in the day' method of writing down the main road #'s/junctions etc. Almost everything in the car easy apart from food! TheJDMStereotype wrote: Almost everything in the car easy apart from food! At the bp where is everyone? The Club wrote: If you arrived here looking for the AGM thread, our apologies as the incorrect link was given. Please click this link to go to the right thread. Thank you. Only sour note came as I attempted to leave,and the car threw a wobbly Many thanks to Nick (Salokin) for his help ,even though my guess at what was wrong proved to be right..
Thankyou everyone who attended today and made it the usual fun RX8-OC event with plenty of banter and humour in the gazebo. Special thankyou to Michael and his son Alex, and also mum in her absence, for the excellent RX8 chocolate cake and choc chip cookies. not to mention the jam sandwiches which Michael seemed to really enjoy, especial when he put a slice of bacon into one! There were other culinary concoctions which were a bit Hestonesk (cannot spell Blumnethal and you can see in the photos. Not all the cars below were on our stand of course! Managed to not record the first 9 Laps grrrr! 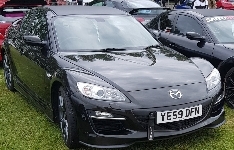 ChrisHolmes wrote: Thankyou everyone who attended today and made it the usual fun RX8-OC event with plenty of banter and humour in the gazebo. Special thankyou to Michael and his son (sorry forgot his name) and mum in her absence for the excellent RX8 chocolate cake and choc chip cookies. not to mention the jam sandwiches which Michael seemed to really enjoy, especial when he put a slice of bacon into one!